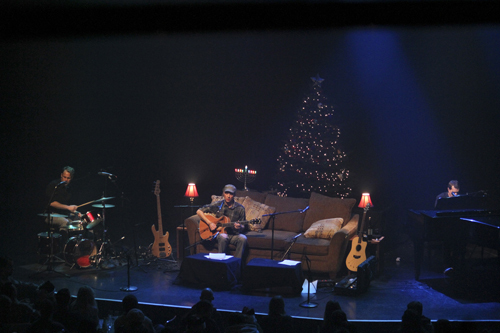 Christmas spirit was all-aglow in Park West on Saturday night for the 11th Annual Brendan Bayliss and Jake Cinninger Acoustic Holiday Show. The halls were decked from the venue's entrance to the stage. People in red and green, some donning festive hats and gaudy sweaters, eagerly filed in to find a spot and post up for the sold-out show that benefited The People's Music School. The stage was converted into a makeshift family room, complete with all of the comforts of home. 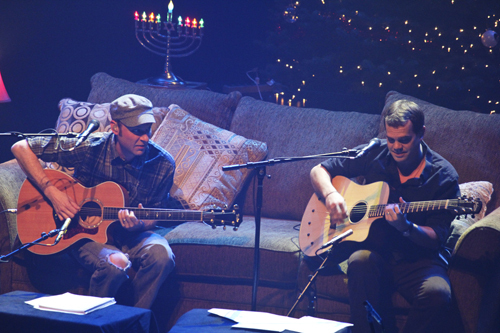 The two guitarists from local jam band Umphrey's McGee, Brendan and Jake, sat next to each other on a couch as they strummed away on their acoustic guitars. The atmosphere was very intimate, which paired nicely with the stripped-down tone of the performance. They kicked off the show with a slew of unplugged Umphrey's originals. Some already featured acoustic guitars, like the melodious "The Pequod," and others did not, like the usually bass-heavy "Puppet Strings." One of the most special things about a show that takes two incredibly high-energy musicians and puts them in a laid back setting is how comfortable they are with the audience. The banter was a lot of fun because they talked more openly about their songs than usual. It was basically like a behind the scenes peek at the main creative geniuses of Umphrey's. Before they played "Passing," Brendan announced it was one of his favorite songs he's written with Jake. The crowd was able to get a sense of which songs they had collaborated on together, especially which ones they were most proud of. The show seemed to get progressively more exciting with each song. "Cut the Cable" was a crowd favorite because it's only been played several times since Umphrey's debuted it a year ago. But, what followed was even more special. While segueing into the next tune, Brendan told the crowd this was the first song he learned how to play on guitar. He then dedicated it to the extended Umphrey's family. The crowd was captivated from the first few, very distinguishable chords of Pink Floyd's "Wish You Were Here." 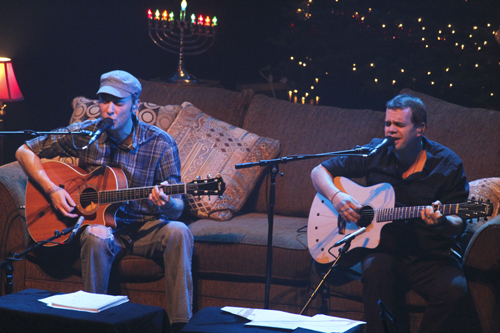 Throughout the show, Brendan and Jake were able to show off their skills on multiple instruments. That, too, was a rare sight, compared to many of their regular shows. Brendan busted out the mandolin for a "Great American" sandwich, in between a Pearl Jam cover and "No Comment." He also played a piano solo to Dave Matthews Band's "Christmas Song." After that, Jake came back onto the stage with the special guest, Umphrey's McGee drummer Kris Myers. Jake said the drum kit on stage was his son's and in order to borrow it, he had to bribe him with milk and cookies. They jumped right in and continued with a hearty mix of originals and covers, many of which seldom make an appearance on Umphrey's set lists. They started with "Gulf Stream," featuring Kris on drums, Jake on guitar and Brendan on piano. After a couple more songs, Jake picked up the bass and the trio played "Hangover," which really added a new dynamic to the performance. A lot of people who were seated at tables on the floor got up, started dancing and shouting the lyrics "all night long." Brendan also made a nice little alter to a string of lyrics and sang "get loose at the Park West." Brendan told the crowd they would play Kris's favorite song, the only one request he had for his appearance. Much to the delight of the crowd, it was a song that's usually saved for very special shows. "Front Porch," which was one of Umphrey's very first songs that has stood the test of 15 years, served as the perfect ending to the set. The announcement of raffle winners, spanning from restaurant gift cards to music festival tickets, gave the guys a quick break before the encore. 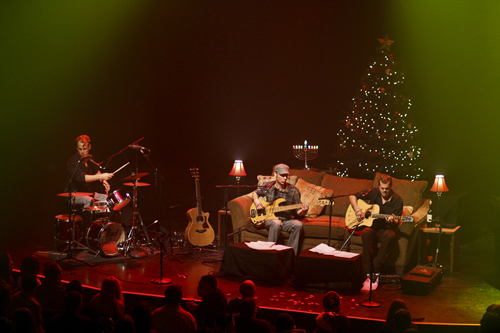 Then Brendan, Jake and Kris came back onto the stage to spread some more Christmas cheer. Jake on drums and Kris pretending to be Robert De Niro in a spoken-word rendition of "Santa Claus is Coming to Town." Then came a special rendition of Black Sabbath's "Black Santa" with Christmas lyrics, which Brendan dedicated to his sister for getting him into the metal band at a very young age. He also pointed to a member of the audience who was wearing a Green Bay Santa hat and said, "Please have the Packer fan in the front row removed," as the rest of the crowd, including his date, cheered. To finish off the night, Brendan, Jake and Kris debuted a new cover that they've never performed before, Red Hot Chili Peppers' "Breaking the Girl," and one last original, "No Diablo," which is another one of Umphrey's newer songs. The show was definitely for diehard Umphrey's fans who wanted to see a few of their favorite musicians in a different light. The payoff was huge, as it was a diverse and beautiful night of music.